I hope ya'll enjoy my new comic-strip. 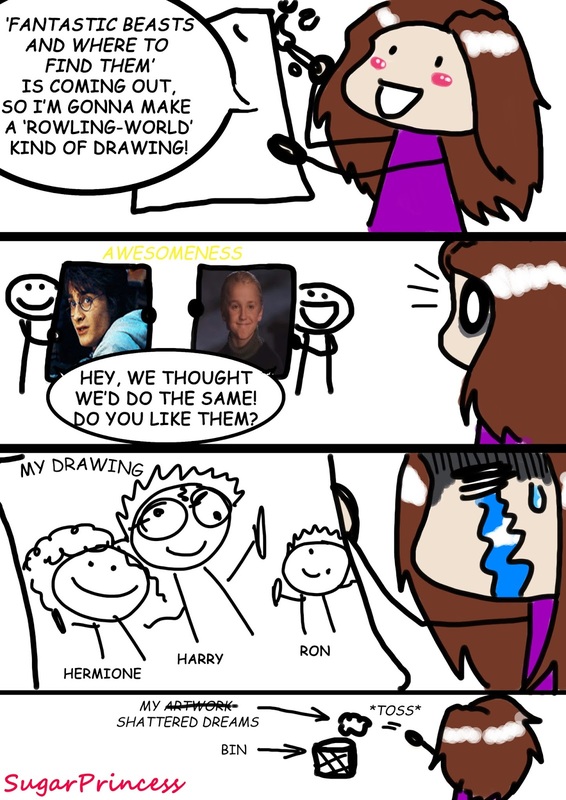 This is literally why I haven't made a Rowling drawing. I like to make drawings to do with films I watch in the cinema and enjoy. I was gonna do the same with Disney's Moana, but I don't think I can see it, sadly. Oh well. Anyways, everyone's drawings online looked so damn amazing that I was put off doing one. 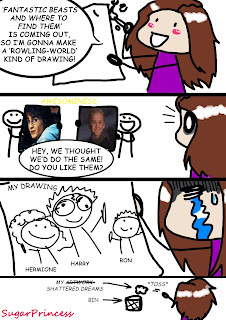 I was gonna do a Hermione drawing, or even the main three, but now... nah. THAT DOESN'T MEAN YOU SHOULD BE PUT OFF DRAWING BY OTHERS. DON'T COMPARE YOURSELF TO OTHERS. EVERYONE IS DIFFERENT. BE PROUD OF YOURSELF!!! Anyway, you remember how I said that I was starting a vlog at the beginning of next year? Well, like most of my plans, it has been pooped on (Not literally... It's just a saying of mine). One of the main things I hate - along with people who say stuff and do nothing, copycats, unoriginality, crumpets and girls who have no respect for themselves - is having to wait for other people and no power over my own life, having someone rule over you. Yeah, so I dunno when the vlog is gonna be made, if ever. There's so many things I'm not able to do which I need/want to. Oh well. Anyway, I hope your December is going well! Hopefully I'll be posting before Xmas.